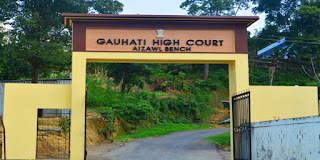 Aizawl, Jul 30 : The Gauhati High Court has granted interim bail to the five accused in the alleged teacher recruitment scam. Justice MR Pathak of the Aizawl bench granted interim bail to Lai Autonomous District Council (LADC) Chief Executive Member V Zirsanga and four other accused and fixed August 4 for the next hearing. The five accused were released on a bail bond of Rs 50,000 each and were restrained from leaving the southern Mizoram’s Lawngtlai district, the officials said. Aizawl District and Sessions Judge Lucy Lalrinthari had rejected the anticipatory bail petition on Wednesday after the Anti-Corruption Bureau (ACB) officials pleaded that the investigation against the accused was hampered as many witnesses were turning hostile. Zirsanga and the four persons were allegedly involved in the Rs 3.19 crore teacher recruitment scam, which is being investigated by ACB. ACB contended that Zirsanga, then an executive member, education in the LADC received bribe amounting to Rs 21 lakh. The investigating officers said that 41 new teachers were recruited fraudulently and the accused included District Education Officer (DEO), a cashier and two teachers.